Hyatt Ziva Puerto Vallarta officially opened earlier this year, and already it has created quite the buzz in the tourism industry. During the property’s official opening, the resort received the official announcement of its AAA Four Diamond status. 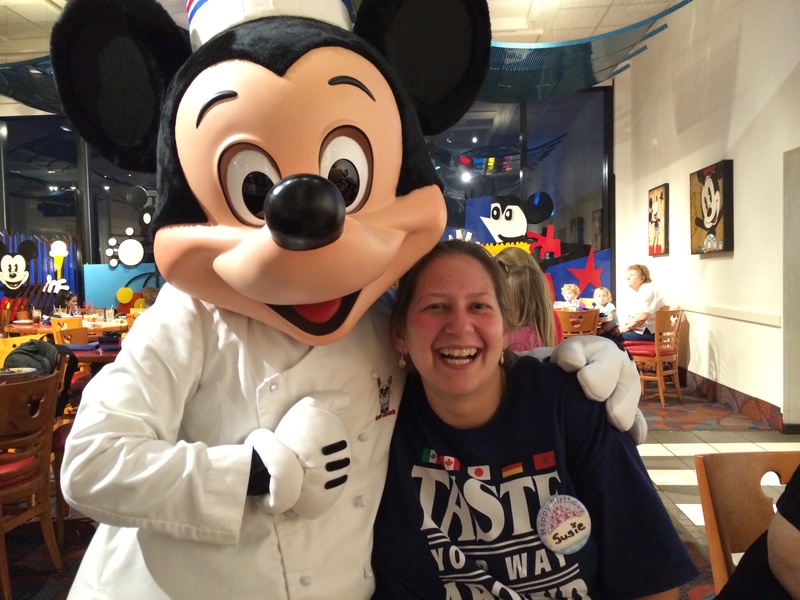 Service is the keystone of a Four Diamond Award winner. A Four Diamond Award-winning hotel offers incredible service, hospitality, and attention to detail, along with upscale amenities and luxuries. de Brouwer attributes the quality of the Hyatt Ziva’s service to this high-level achievement. Though impeccable service is the keystone of a Four Diamond Award winner, Hyatt Ziva Puerto Vallarta provides scrumptious culinary delights, exquisite accommodations, and special touches that set the property’s all-inclusive experience as the new standard of luxury in Mexico. 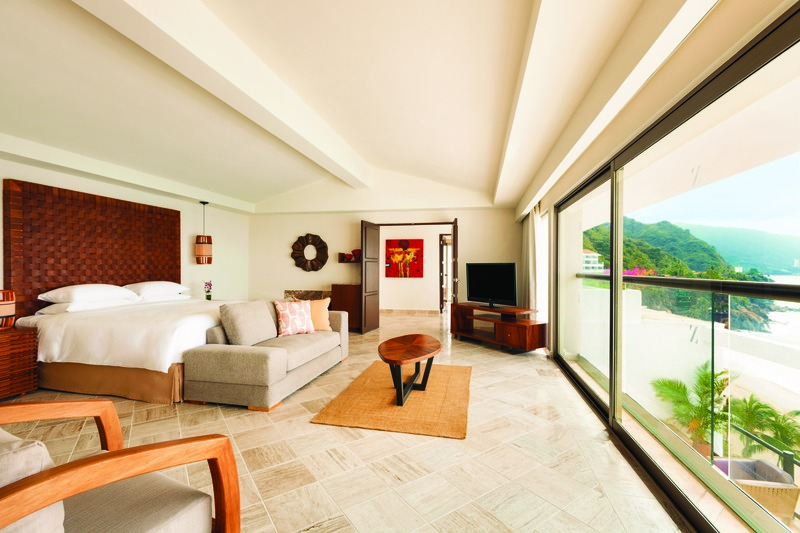 Coupled with a recent $20 million renovation and refurbishment, Hyatt Ziva Puerto Vallarta truly welcomes guests to a luxurious escape. The property has lured luxury seekers for more than 30 years as the Camino Real Puerto Vallarta and Dreams Puerto Vallarta, but with the reopening as Hyatt Ziva Puerto Vallarta, the resort has received a new main building and lobby to connect the resort towers while providing a location for the new pools, spa and hydrotherapy circuit, gym, restaurants, and lounges. The rooms and suites were also completely renovated. New pools are just one of the many upgrades the Hyatt Ziva Puerto Vallarta completed on the property. “What guests now enjoy is a village-style atmosphere that enables them to enjoy the beautiful beach and find the perfect atmosphere for their mood – everything from the fun and excitement around the main pool with its activities and tasty food carts, to the quiet adult pool with its own lounge, perfect for reading and relaxing,” says de Brouwer. But the best part of the resort isn’t the upgrades. 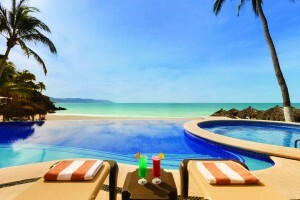 See Related: Discover Puerto Vallarta – Riviera Nayarit! 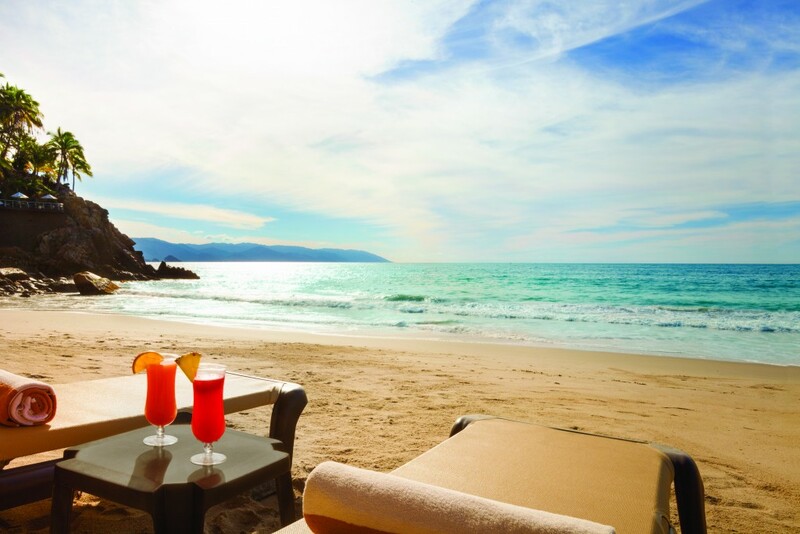 La Estaces is the focal point of the resort, which sits on one of the only secluded beach alcoves in Puerto Vallarta. This allows Hyatt Ziva Puerto Vallarta to offer a wide range of water sports and activities, including kayak lessons and kayak fishing lessons. “We also have the most beautiful spa with a spectacular ocean view that includes an indoor/outdoor lounge area overlooking the Pacific,” boasts de Brouwer. The beach is quite spectacular as dolphins swim right up to the cove, allowing guests to feed them, and during the winter, guests can whale watch from the golden sand. It is also a traditional spot for sea turtles to lay their eggs every year, and guests can even release a baby turtle to sea. So of course, de Brouwer’s favorite place in the resort includes the beach. 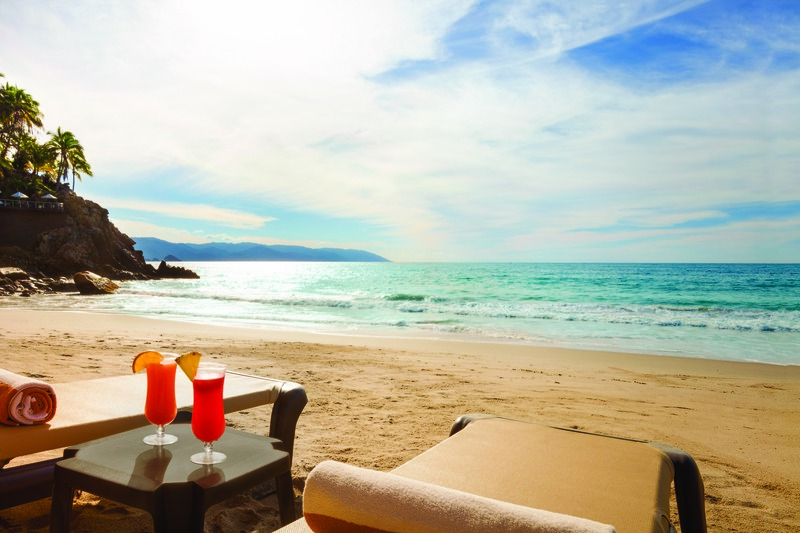 Luxury at Hyatt Ziva Puerto Vallarta has a different connotation than most all-inclusive resorts. While every guest receives the usual three meals and snacks, unlimited domestic and international brand liquor, in-room mini-bar stocked daily, and Wi-Fi access, this property offers such refined inclusions as wine and tequila tastings, nightly turndown service, and complimentary use of the hydrotherapy circuit at the spa. 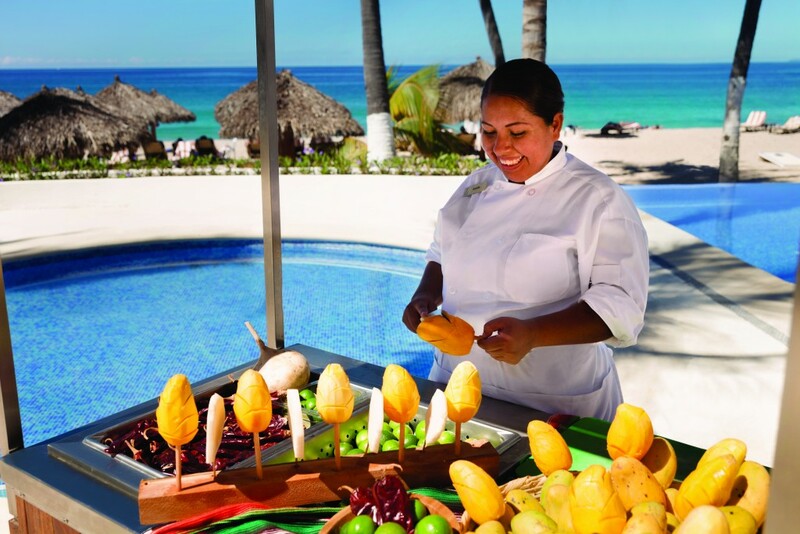 Experience authentic Mexican treats with food carts about the pool area! Among these extra touches: a welcome cocktail, marshmallow roasts over the property’s fire pits, and kayak fishing lessons. 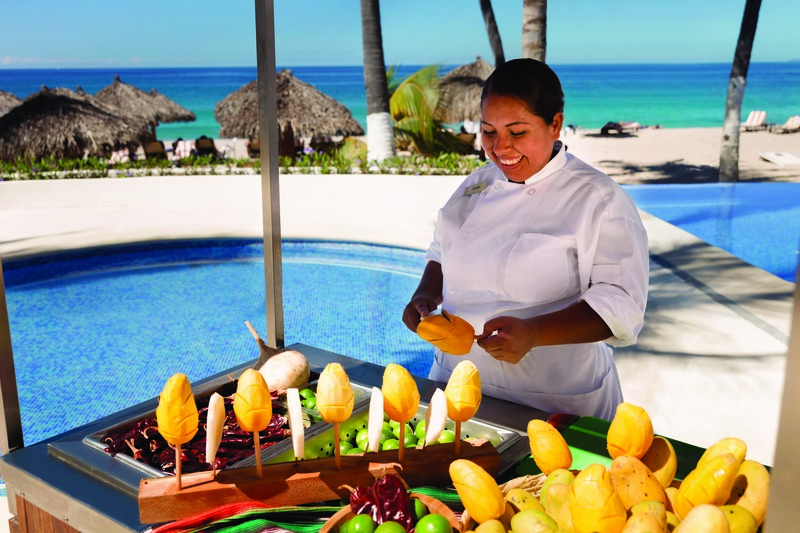 Food carts around the pool area offer local favorites like “street” style tortillas, homemade ceviche, and peeled papaya on a stick, because Hyatt Ziva also wants guests to enjoy Puerto Vallarta as a world-class destination. Puerto Vallarta is one of Mexico’s hot wedding destinations, and Hyatt Ziva Puerto Vallarta hosted its first wedding in January. 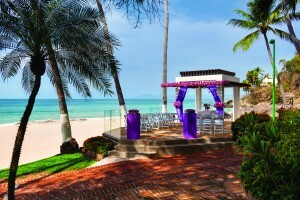 Celebrate a beachfront wedding in the resort’s gazebo or choose one of the many venues around the property. The menu included a preferred drink prepared with tequila, and the ceremony ended with a fireworks spectacular. 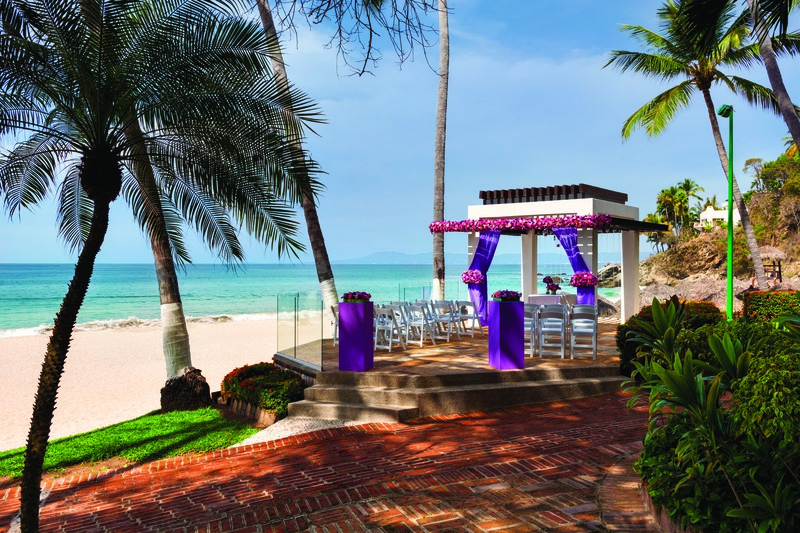 The beach isn’t the only setting for weddings at Hyatt Ziva Puerto Vallarta. Included in the renovations was the addition of a spectacular sky wedding suite. “Our exclusive sky rooftop-wedding suite is perfect for a sunset ceremony and reception,” explains de Brouwer. The resort also offers three different wedding packages that include the basic needs of the bride and groom, like serene venues for ceremony and reception, live entertainment, salon/spa, florist, unique menus, customize decorations, and more. Though Hyatt Ziva is a family-friendly resort, it does boast an adults-only section of the resort, including an adult-pool area, perfect for honeymooners. One of the most important features of any all-inclusive resort is the food, so just what does Hyatt Ziva Puerto Vallarta offer guests? de Brouwer explains the exquisite culinary lineup of four internationally infused a la carte restaurants and a sumptuous buffet restaurant. 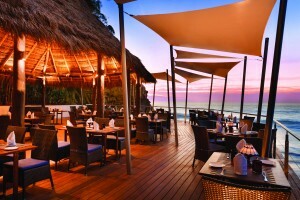 Enjoy the soft, hypnotizing rumble of the waves at Blaze, an oceanfront dining experience. – BLAZE: This unique grill experience in Puerto Vallarta is next to the beach and offers a spectacular view of the Pacific. The menu includes Caribbean lobsters, steaks, and other meats, including lamb, as well as regional favorites such as Puerto Vallarta style ceviche. This scenic restaurant serves breakfast, lunch and dinner, and in the mornings offers traditional Mexican breakfasts and specialty Mexican cinnamon infused coffee. 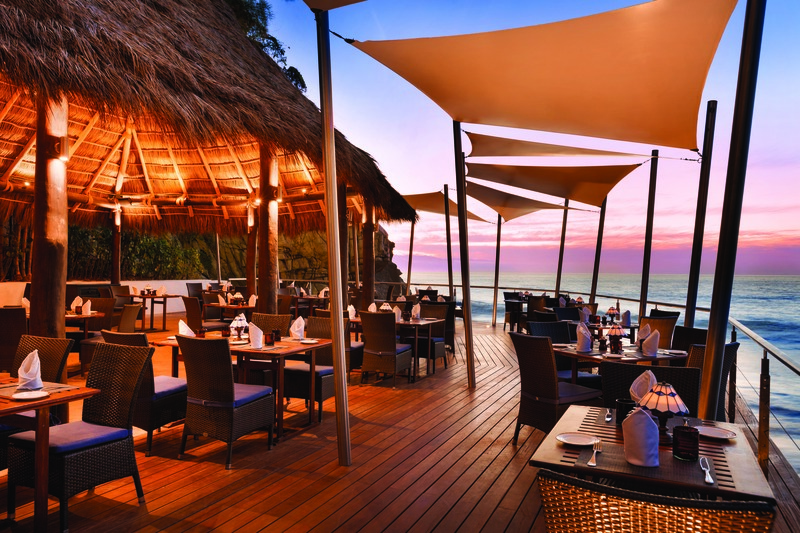 – PUREZA: Also a beachside restaurant, Pureza offers a dinner menu inspired by authentic Asian specialties created with the freshest ingredients of Mexico’s Pacific coast. – CASA GRANDE: Open for dinner, this restaurant offers authentic Mexican food with a Puerto Vallarta and Jalisco twist. It also features a Tequila Bar with the resort’s own Tequila Master who is available to help guests understand the nuances of tequila sipping, tequila food matching, and even tequila “flights” for tastings. – MELANZANE: Feel the Italian spirit on the Pacific Coast of México at this Trattoria on the Terrace for lunch, featuring brick oven pizzas and, in the evening, fine Italian dining with a traditional antipasto bar. – VIVAZ: This international buffet experience features chef cooking stations and fresh fruit stations where chefs are slicing fruit and preparing smoothies. Arranged like an exciting international market, the foods are displayed in colorful and appetizing arrays. 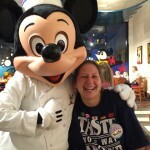 There is a separate children’s buffet with bite-sized sandwiches, fresh fruits and vegetables, and healthy choices. Don’t forget the food carts around the pool!